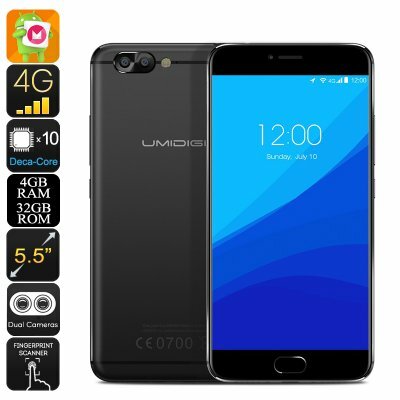 Successfully Added UMIDigi Z Pro Android Phone - 5.5 Inch, Dual-IMEI, 4G, Dual-Camera, Deca Core CPU, 4GB RAM, Google Play to your Shopping Cart. The UMIDigi Z Pro is one of China’s newest and most significant flagship Android phones launched in the beginning of 2017. As one of the first mobile phones that features the Deca-Core Helio X27 CPU, it is guaranteed to outperform the vast majority of competing Android Smartphones on the market. Designed to deliver a speedy yet energy efficient performance, this powerful CPU will treat you with a user experience like never before. Clocked at 2.6GHz, it packs all the power needed to tackle games, movies, and mobile applications without dropping a frame. Along with its extremely powerful processor comes 4GB of RAM that allows you to use numerous of the phone’s features at once without needing to worry about slowing down your latest Android phone. No matter what you throw at this little beauty, it is guaranteed to handle your toughest demands and treat you with an exceptionally smooth smartphone experience. Packed within its sleek and stylish body, this Android phone holds a stunning Full-HD display. On this 5.5 Inch screen, this phone portraits all your favorite media in breathtaking 1080 resolution – allowing you to enjoy vivid color and stunning detail. Along with its 32GB of internal storage and the additional possibility to add 256GB memory externally, this Android phone is guaranteed to hold all the space needed for you to save all your files and media alike. Simply head out to the Play Store and download one of the million free to download applications. With this Android phone at your side, you’ll never have to feel bored again. Running on an Android 7.0operating system, the UMIDigi Z PRO provides you with all the software features that Android phone users are familiar with. Additionally, it allows you to easily upgrade your phone to Android 7.0, delivering the latest and most up-to-date features the mobile industry has to offer. With its epic 3780mAh battery, it brings along a stunning 20 hours of continuous usage time – letting you enjoy all the newest Android features, games, and applications for numerous days without needing to worry about recharging your device. Coming with two IMEI numbers, this Android smartphone offers great connectivity. Being reachable on two different phone numbers while using merely one device, makes this Android phone perfect for business people that wish to separate their work and private life. Additionally, it supports 4G connectivity through which it provides you with the fastest mobile data speeds out there - ensuring that, no matter where you’re at, you’ll always be able to stay connected to friends, family, and colleagues back home. Not only will you be able to call with all your loved ones located at the other side of the world, its stunning 13MP dual-camera furthermore allows you to shoot and instantly share ultra-HD photographs and 4K video not matter where you’re at. The UMIDigi Z Pro comes with a 12 months warranty, brought to you by the leader in electronic devices as well as wholesale electronic gadgets..
Arabic: - الروبوت الذكي - Chinese Simplified: - Android 智能手机 - Czech: - Smartphone se systémem Android - Danish: - Android Smartphone - Dutch: - Android-Smartphone - French: - Smartphone Android - German: - Android Smartphone - Hebrew: - הטלפון החכם אנדרואיד - Hindi: - एंड्रॉयड स्मार्टफोन - Italian: - Smartphone Android - Japanese: - Android スマート フォン - Korean: - 안 드 로이드 스마트폰 - Malay: - PINTAR telefon Android - Norwegian Bokmål: - Android Smartphone - Romanian: - Un Smartphone Android - Russian: - Android смартфон - Spanish: - Smartphone Android - Thai: - สมาร์ทโฟน android - Turkish: - Android Smartphone.